Words-Surf is the PUP that uses misleading techniques to prevent removal. Use Reimage to locate malicious components and get rid of them faster than with uninstall instructions. A full system scan blocks virus reappearance and prevents traffic to malicious domains. How can Words-Surf hijack my computer? How to remove Words-Surf virus? 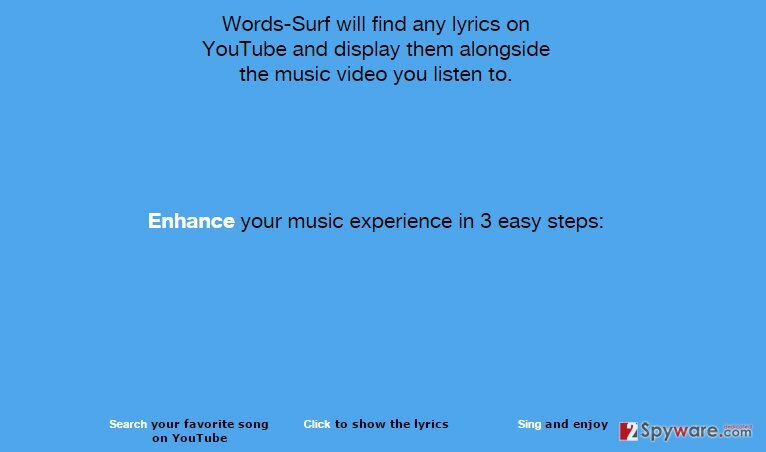 Words-Surf by Revizer Technologies Ltd. is yet another member of applications that are related to lyrics. It is very similar to LyricsBuddy, LyricsContainer, Lyricsget, SeeWords, and many other apps that promise to find lyrics of various songs and display them alongside Youtube music videos. This service may seem handy for those who seek like singing along with the music they are listening to. However, before using this app you should know several things that may start happening right after installing Words-Surf virus. First of all, the installation of this tool itself may be a negative surprise for you. That’s because it is commonly spread alongside other freewares and sharewares, so you may install it unconsciously. That’s why security experts have categorized it as a potentially unwanted program. Besides, it is also known as an adware and there is an important reason for that. Once installed, Words-Surf adware starts displaying sponsored advertisements on each of the user’s web browsers (Google Chrome, Mozilla Firefox, Internet Explorer). This app is closely related to third partied who seek to promote their websites, increase sales or spread another software. Generally speaking, this application works as a medium between third parties and Internet users because its developers earn the money for displaying predetermined third-party advertisements while people browse the net. Therefore, no matter that you may receive ads labeled as “Ads by Words-Surf”, “Words-Surf Ads”, “Powered by Words-Surf”, and similarly marked advertisements, do not fall for believing that they are filled with reliable content. Clicking on them you may be rerouted to suspicious third-party websites that may be involved in spreading potentially unwanted programs. Not to mention, Words-Surf virus is blamed for spying on its users. Once installed, it may drop tracking cookies and start collecting search terms, mostly visited websites, data entered in them, clicks, IP address, PC’s location, email address, and so on. Even more, it may corrupt various settings withing registries, Windows startup and cause your web browsers to slow down significantly. Therefore, we highly recommend you remove Words-Surf virus without a delay. The program that we would recommend in this particular case is Reimage. Words-Surf does have the official website. However, it’s not possible to download it right there because download button is not active. 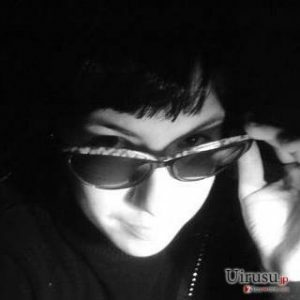 Therefore, the fact that it has already infiltrated lots of computers indicates that its developers employ deceptive distribution method. Recent research has shown that Words-Surf virus is commonly spread bundled with other freewares and shareware. Therefore, it may enter computers in a suspicious manner and settle down on web browsers without requiring explicit authorization. If you want to prevent unwanted downloads, your task is to start installing freewares more carefully. Forget Quick or Basic installation because instead of that you should opt for Advanced or Custom installation. It expands the process a bit and, therefore, discloses ‘optional components’ and allows deselecting them. Thus, never rush when installing freewares and always read all the terms carefully. Here, look for Words-Surf or any other recently installed suspicious programs. Wait until you see Applications folder and look for Words-Surf or any other suspicious programs on it. Now right click on every of such entries and select Move to Trash. When in the new window, check Delete personal settings and select Reset again to complete Words-Surf removal. Once these steps are finished, Words-Surf should be removed from your Microsoft Edge browser. Here, select Words-Surf and other questionable plugins. Click Remove to delete these entries. Now you will see Reset Firefox to its default state message with Reset Firefox button. Click this button for several times and complete Words-Surf removal. Here, select Words-Surf and other malicious plugins and select trash icon to delete these entries. Click Reset to confirm this action and complete Words-Surf removal. Here, select Extensions and look for Words-Surf or other suspicious entries. Click on the Uninstall button to get rid each of them. Now you will see a detailed dialog window filled with reset options. All of those options are usually checked, but you can specify which of them you want to reset. Click the Reset button to complete Words-Surf removal process. This entry was posted on 2015-09-22 at 01:55 and is filed under Adware, Viruses. You can quickly scan the QR code with your mobile device and have Words-Surf ads manual removal instructions right in your pocket. 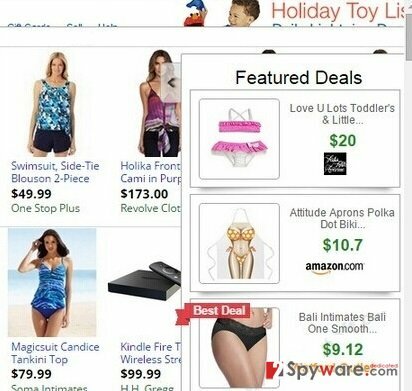 How did you remove Words-Surf ads?